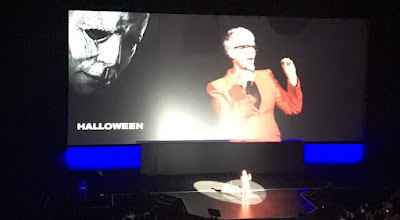 As part of Universal’s presentation at CinemaCon, Jason Blum and Jamie Lee Curtis were on hand to talk David Gordon Green’s Halloween, taking to the stage to divulge some juicy tidbits while also showing off the very first footage from the movie. The trailer starts with a woman checking sound—“1, 2, 3, testing.” She and another man are making a documentary about a murderer, as tends to be a thing these days. It’s about a man who escaped from a mental institution 40 years ago, killed several people, and was shot by his doctor. As this is being explained, we see the crew setting up, looking at some documents and listening to audio explaining the horrific situation from 1978. There are drawings of Dr. Loomis and more. The filmmakers walk out into a courtyard that looks like a giant red and white checkerboard. All across the area, patients have spread into their own little areas and the crew walks up to one in particular. “Hello Michael,” the man says, “I have something you might like to see.” He goes into his bag and pulls out something. First, we see hair, then, white. Yes, this is his mask. The mask. As it’s being revealed, the other patients are getting agitated, making noise, screaming, one person is chained up and banging the chain down over and over again and the tension gets incredibly high. Cut to Haddonfield, Illinois. Kids are walking on the streets very much like the original movie and, we realize, one of these is the granddaughter of Laurie Strode, the girl who Michael Myers terrorized 40 years ago. The girl explains that her grandmother has long been traumatized by the incident and that, despite rumors, Michael is not her brother. (Which is a nod to the fact this movie ignores every other Halloween movie besides the first one). Enter Laurie Strode 2018, played once again by Jamie Lee Curtis. Apparently, she’s spent the last 40 years preparing in case Michael ever returned. She’s trained, she has guns, her house apparently has secret passages and booby traps. She tells someone that she prays every night that Michael Myers would escape and they ask why. “So I can kill him,” she says. And we cut to her in the woods blowing away a dummy for target practice. Next, Laurie learns that a bus from the mental institution crashed and that Michael has escaped. The trailer then shifts to a bathroom where a girl is sitting in a toilet stall. A pair of boots enters the room. She explains that the stall is occupied. We see that, in another room, a man in a garage has been killed. Back in the bathroom, a closed fist goes over the top of the stall and drops something onto the girl. It’s teeth. She screams. Cut to Myers finding the mask and putting it back on... John Carpenter's score kicks in. Michael has made his way back to Haddonfield. Laurie says she’s going to protect her family and we see that it’s Halloween and the streets are packed with kids. Then, she sees him in an upstairs window. Laurie takes aim and fires. But she hit a mirror. The trailer ends in the room of a young boy. He asks his babysitter to close the closet door. She tries, but it won’t close. She tries again. And again. Finally, she opens the door to see what’s blocking it and, yup, it’s Michael Myers. He grabs her and the trailer ends.